It finally feels like spring and that means it’s time for the Back Bay Ringers’ spring concerts. 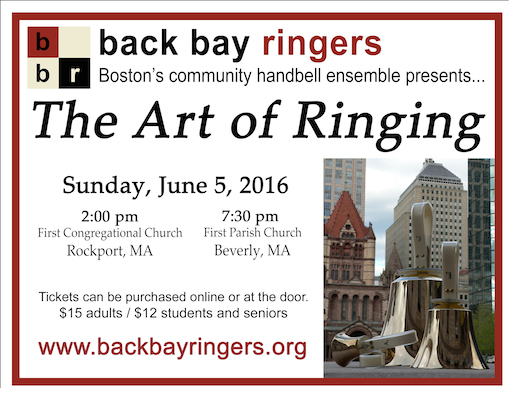 Handbell ringing is a passion for all of us involved with the Back Bay Ringers and we are always proud to bring you our art form. This spring we are presenting The Art of Ringing, which will showcase Boston’s deep connection to handbell ringing. Join us on Sunday, June 5 for concerts in Rockport, MA at 2:00 pm and Beverly, MA at 7:30 pm. We are excited to bring you some old classics and as well as our new favorites! Click HERE for details and tickets. On May 17th we had a very successful Boston Handbell Festival, which saw Choirchimes distributed to the Donald McKay School in East Boston and Watertown Middle School. Congratulations to both! I’d like to offer a warm thanks to all our generous donors that make this program possible! And for this special 10th Anniversary year, we give a very special appreciation to the Boston Cultural Council and the Massachusetts Cultural Council for supporting our work in music education. Two other dates to put on the calendar: our annual Summer Ring will be held on Monday, August 15th, and Auditions for the 2016-2017 season will be Monday, August 22. Keep your eyes on our website for additional details. Can’t wait to see you all on June 5th! 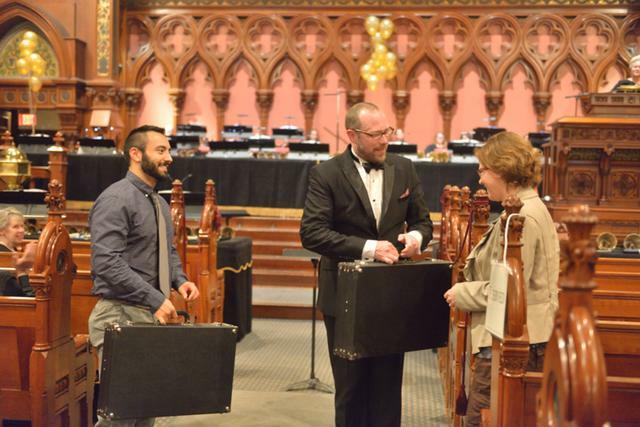 BBR Artistic Director, Griff Gall, distributes Choirchimes to music teachers from Watertown Middle School and the Donald McKay School at the 10th Annual Boston Handbell Festival. Join us on June 5th! Click HERE for tickets.